“What can you do with a rice grain? Or even a pigeon if you know. But can you make a god? I live somewhere you might not know. 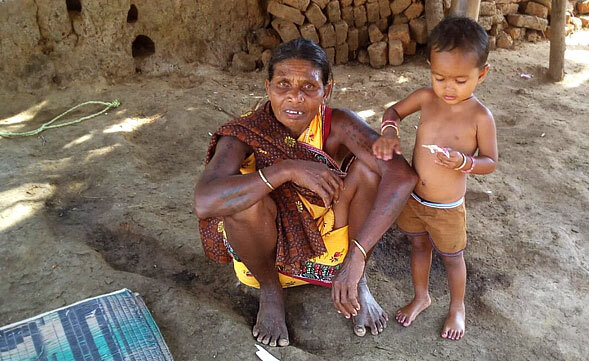 Munda are an ethnic tribal (Adivasi) group of people of the Chota Nagpur Plateau region. They are found across much of Jharkhand state as well as adjacent parts of Assam, Odisha, West Bengal, Chhattisgarh, Bihar and in parts of Bangladesh. Their language is Mundari, which belongs to the Munda subgroup of the Austroasiatic language family. 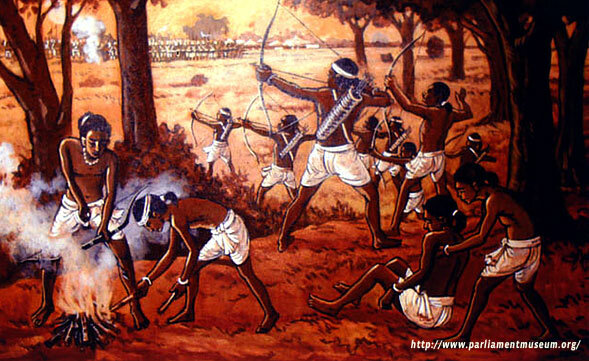 Since the primitive times Munda people have been wanderers & hunters before they became agricultural cultivators. Unlike various communities across the world Mundas have extensive rituals to celebrate birth, death, engagement, marriage etc. Birth of a baby boy is celebrated as an earning hand to the family; birth of baby girl is celebrated as a caretaker to the family. They perform an engagement ceremony called as Lota-pani (which means Pot and water) in marriage, which is considered as one of the main rituals of life and is a weeklong festival for both the families. Ointment with scented oil and turmeric is applied to the face & body of the departed, to give a last decoration as last ritual. Buried ancestors are memorialized as ‘Guardian’ spirits of the ‘khunt’ or genealogical family, symbolized by burial stones. The landscape of Chotanagpur is dotted with Cemeteries having clusters of these two types of stones, sasandiri (burial stones) and bhodiri (head-stones). Ancestors are given due respect as guardian spirits. There are huge regards for everything nature provides – the air, the water and even the fruits of the soil. 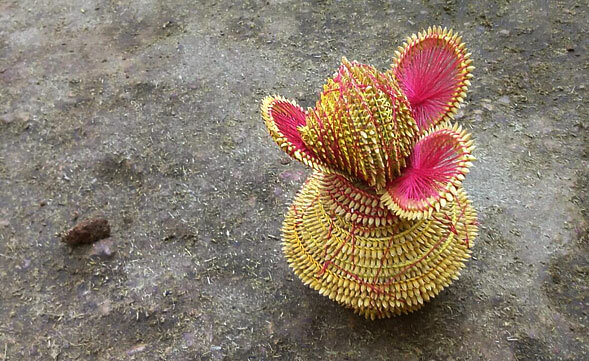 And so they turn all that they get into works of art, like the ‘Dhaan Murti’ (unhusked rice grain idols). Dhana Murti or unpeeled rice grain idols are distinctive to this region. 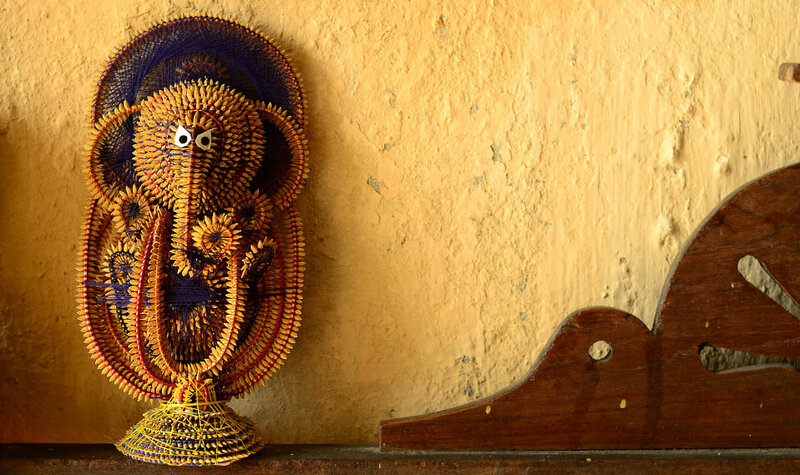 This is made using three key elements; rice grains, bamboo slivers and colored threads. 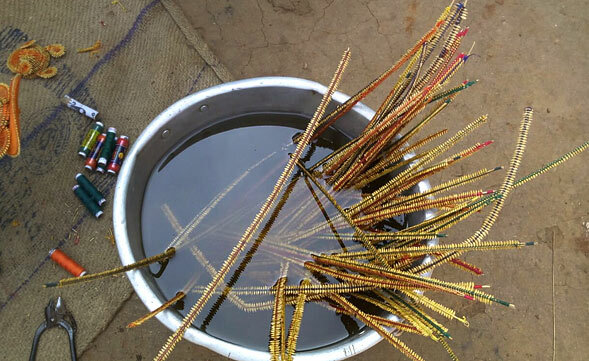 The bamboo slivers are primarily soaked in turmeric water and dried in the sun to make them more pliable. 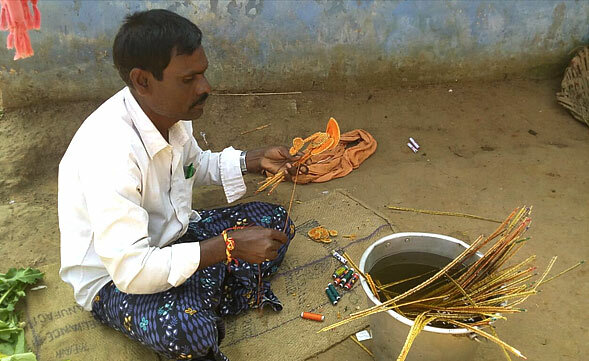 Then the children loop the rice grains intricately between two thin bamboo slivers using colored cotton threads alone. Then the men sit to fold and coil the rice sticks into various forms creating both objects and idols. The coiled sticks are held in place with a convolution of colored cotton threads, evolved overtime to look like beautiful patterns. The idol can be of goddess Lakshmi or Ganpathi, which is finally adorned with ‘bindis’ placed to fit the context. Its amazing how such an expression is conjured with such simple components and incredible work of art and design. Their final regard to mother earth is ‘kalash’ (Urn) and ‘Mor’ (Peacock), which are both symbols of prosperity, integrity, beauty and vibrancy. As the saying goes; patience is a virtue and what can be a better example than an expression with rice grains.